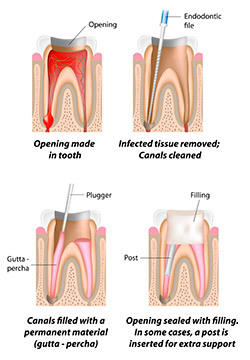 Root canal therapy is a treatment used to save and repair a badly decayed or damaged tooth instead of extracting it. If you are experiencing any of these symptoms, please contact our office to make an appointment with Dr. Keselbrener as soon as possible to have your tooth examined. When the nerve of the tooth becomes infected or damaged, Dr. Keselbrener believes that root canal therapy is the treatment of choice, as it is the only treatment option that preserves your original natural tooth. In most cases, root canal therapy is a very predictable procedure with a 95% success rate. The only alternative to root canal therapy is having the tooth extracted and replaced with an implant, bridge, or removable partial denture to restore chewing function and prevent adjacent teeth from shifting.